To Cite: Ebrahimpour F, Sadeghi N, Najafi M, Iraj B, Shahrokhi A. Effect of Playing Interactive Computer Game on Distress of Insulin Injection Among Type 1 Diabetic Children, Iran J Pediatr. 2015 ; 25(3):-. doi: 10.5812/ijp.25(3)2015.427. Background: Diabetic children and their families experience high level stress because of daily insulin injection. Objectives: This study was conducted to investigate the impact of an interactive computer game on behavioral distress due to insulin injection among diabetic children. 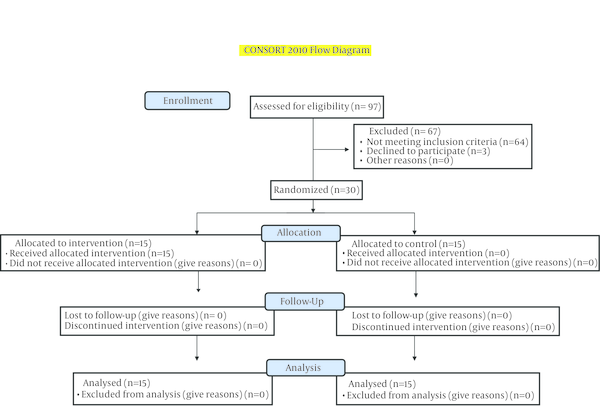 Patients and Methods: In this clinical trial, thirty children (3-12 years) with type 1 diabetes who needed daily insulin injection were recruited and allocated randomly into two groups. Children in intervention groups received an interactive computer game and asked to play at home for a week. No special intervention was done for control group. The behavioral distress of groups was assessed before, during and after the intervention by Observational Scale of Behavioral Distress–Revised (OSBD-R). Results: Repeated measure ANOVA test showed no significantly difference of OSBD-R over time for control group (P = 0.08), but this changes is signification in the study group (P = 0.001). Comparison mean score of distress were significantly different between two groups (P = 0.03). Conclusions: According to the findings, playing interactive computer game can decrease behavioral distress induced by insulin injection in type 1 diabetic children. It seems this game can be beneficial to be used alongside other interventions. Injection is a main source of fear, pain, anxiety and may lead to different levels of distress among children (1, 2) particularly who should have aggressive treatment like frequent injections resulting from chronic conditions (3, 4). Type 1 diabetes (T1D) is one of the most common chronic diseases in childhood (5). Children diagnosed with T1D should be treated with multiple daily insulin injections (6, 7). Rzeszut (2011) reported that fear and anxiety due to insulin injection are common in children with T1D (8). Howe et al. have shown that 40.9% of children with T1D had fear of insulin injection and 75% of children below 9 years old experienced higher fear in the starting of insulin therapy (9). A similar study by Antal et al. (10) showed that half of parents had a history of diabetes-related injection distress in their children such as verbal resistance, whine, refuse to come into the room or get proper position for the injection, squirm to escape. Also common child’s behaviors during first month after diagnosis were upset, angry, and unhappy. Insulin therapy is main treatment of T1D (6, 7). If children with T1D cannot cope with these daily injections, the distress and anxiety due to injections will affect their daily life. This distress may influence children’s cooperation while injecting, hence they will experience poor treatment, higher HbA1c level, negative attitude toward diabetes (8, 9). There are no enough interventions and studies about relieving distress in children with T1D. Study of Sewell (2004) have shown that education of deep breathings and relaxation techniques are effective to decrease anxiety-related self-injections in adolescents with T1D (11). Some studies have also indicated that show films like "peer modeling film" may affect insulin self-injection learning but no effect on reducing anxiety (12). Slifer et al. showed that parent-training interventions such as use of electronic toy, verbal and written descriptions, modeling, role playing, and other behavioral strategies are not effective to decrease children distress of needle procedures (13). In recent years, computer game has become an attractive and enjoying entertainment among children and adolescents (14-16). Some researchers believe that computer and video games can be effective to improve health-related outcomes (17). There are many studies on positive effective of video games on improvement of physical rehabilitation in children with cerebral palsy (18) and cystic fibrosis (19), facilitating spirometry in younger children (20), increasing the level of disease-related knowledge in children with cancer (21), improvement of self-care in adolescents with diabetes (22). Also, the researchers have found significant findings about the effectiveness of video games on pain relief during burn dressing (23, 24) and anxiety reduction in pediatric surgery (25). Many authors claim video games that are related to the reason of fear and anxiety of children and their developmental have been more effective in adaptation with medical procedures (23). There is a question here whereas new technologies such as computer games can reduce the behavioral distress due to insulin injection in children with type 1 diabetes, to find the answer; we didn’t find any especial computer game for reducing behavioral distress of diabetes children. So, we designed and programmed an interactive computer game about insulin injection and have studied its effect on the behavioral distress induced by insulin injection in children with type 1 diabetes in Isfahan, Iran. This randomized controlled clinical trial was conducted on T1D children who referred to Isfahan Endocrine and Metabolism Research Center, Iran in 2013. Inclusion criteria were age between 3-12 year, administering insulin by mothers by use of syringe or insulin pen, as well as observed behavioral distress in children, or what their mothers’ stated as children’s distress while injecting insulin, willing to participate in the study, no morbidity of specific mental and physical disorders, and home availability of computer. Exclusion criteria were uncooperative mothers or children in follow-up, and who had acute recent problems (acute illnesses, hospitalization, and death of close family members). Demographic Form: Data were gathered by demographic questionnaire include child's age, gender, the number of daily insulin injections, injection tools and illnesses history that completed by the mothers. Observational Tool: Child behavioral distress was measured by Observational Scale of Behavioral Distress–Revised (OSBD–R), its validity and reliability has been verified by Elliot et al. (26). OSBD–R consists of eight behaviors that are indicative for children distress result from therapeutic procedures. These behaviors and their weights in this tool are crying (1.5), screaming (4.0), restraining (4.0), verbal resistance (2.5), and information-seeking (1.5), solicitation of emotional support (2.0), verbal pain expression (2.5) and flail (4.0). A total score 22 is considered as higher level of behavioral distress (26). In this study, OSBD-R was completed by mothers. We thought mothers how to complete the OSBD-R at home, they have been requested to observe their child behavior before injection to two minutes after the injection, and then mark observed behaviors in the checklist. Total scores were calculated by researchers. The Iranian version of the OSBD-R was found to be good valid and reliable (27). We used test-retest (r = 0.79) and cronbach's alpha (r = 0.85) to verify reliability of OSBD-R.
Game design: “Koodak-e-Tavana” is an interactive computer game that programmed for first time by Ebrahimpour et al. (2013), in this study this computer game utilized for teaching diabetic children about diabetes and insulin injections to decrease their anxiety and distress (28). Game content: the computer game has seven parts including:1) paired game (familiarize with equipments needed for insulin injection ); 2) puzzle game (observing another child that has no fear of insulin injection); 3) question and answer game (some educational topics on insulin injection); 4) insulin kit game (preparing insulin kit); 5) painting room; 6) story game (narration a short story); 7) insulin injection-room (creating a simulated environment for insulin injection) (28). Stage 1: The participants in this study were thirty children with type 1 diabetes and their mothers who randomly allocated study (n = 15) and control (n = 15). An informed consent was signed by all participated mothers. In both groups, mothers were asked to complete OSBD-R for three times injection during first week at home. Stage 2: In the second week, both groups came to the Isfahan Endocrine and Metabolism Research Center in two different days. Children in study group received a CD of “Koodak-e-Tavana” computer game. They were asked to play at least once a week with the CD at home. There was no intervention for control group in this step. In both groups, mothers were requested to fill OSBD-R during one of the daily insulin injections for a week. Stage 3: During third and fifth week (no play with the game) the checklists completed as the same way in first week. Finally, OSBD-R checklists collected and calculated the mean of distress score in each stage. This study was approved by the research and ethic committee of Isfahan University of Medical Sciences in Iran to number 12/4/0.5/162. Registry code in an Iranian Clinical Trial Registry center is IRCT2012123011941N1. The data were analyzed using SPSS, version 14. Chi square and t-test were used for controlling demographic characteristics in groups. Repeated measure ANOVA and Mann-Whitney tests were used for comparing of behavioral distress score in two groups. Pearson correlation and Mann-Whitney tests were used to evaluate associations between behavioral distress and demographic characteristics. Statistical significance was defined as P < 0.05. Demographic characteristics of both groups are presented in Table 1. There was no significant difference between the two groups in this regard (P > 0.05). Table 2 contains the mean scores of distress by group over time, and Figure 1 shows a graph of those means. The results of the repeated measure ANOVA showed no signification difference of OSBD-R mean score in over time for control group (P = 0.08), but this changes is signification in the study group (P = 0.001). The results indicate signification decreases in distress over time in the study group. Also, results of the repeated measure ANOVA showed Comparison mean score of the behavioral distress over time significant statistical differences between two groups (P = 0.033). Diabetic children who played with computer game were significantly lower behavioral distress during insulin injection than the control group. aAbbreviation: OSBD-R, observational scale of behavioral distress–revised. bResult of Repeated measure ANOVA analysis of variance: f= 7.61, df = 3.
cf= 5.39, df = 1.
df= 3.38, df = 3. In addition, the result of Mann-Whitney tests showed no significant differences between these groups in the comparison of the mean ranks of behavioral distress before (P = 0.87), during (P = 0.17), after (P = 0.19) and two weeks after the intervention (P = 0.18). Pearson correlation coefficient showed significant association between of age, illnesses history and number of daily insulin injections with behavioral distress of before intervention. In the present study, Younger children (P = 0.045, r = -0.43), with lower duration illnesses (P = 0.035 r = -0.47) and the high number of daily insulin injections (P = 0.04 r = 0.44) presented more behavioral distress in insulin injection. The mean playing time was 23.20 minutes (SD = 15.8 Rang = 5-60), and the mean number of computer game played was 5.2 (SD = 2.75 Rang = 1-11). Pearson correlation coefficient showed no significant correlation between playing time and number of computer game played with decrease OSBD-R mean score in study group (p > 0.05). Also, the results show that 40% of children in the computer game group (Odds Ratio = 6, 95%Cl) have experienced insulin self-injection during the intervention for the first time which this rate was 10% in the control group (Figure 2). This study showed that interactive computer game is effective in decreasing children’s behavioral distress during mother-administering insulin injection. Other researchers have shown positive effects of video games on reducing behavioral distress of burnt children and increasing their cooperation while change dressing (29), as well as pain relief in preschool children (30-32). Landier et al. indicated that computer games as affective cognitive interventions can reduce behavioral distress and fear of venipuncture and venous port access among children and adolescents who suffer from cancer (33). In the past, most computer or video games applied as a distraction method, and they were not necessarily relevant with the specific procedures. 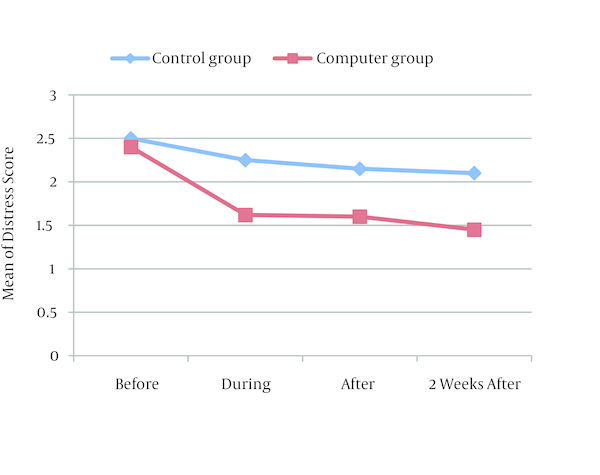 This study showed positive effect during use of computer game and even during two weeks after end of the intervention. Therefore, it is necessary to use efficient strategies for reducing children’s fear, anxiety and behavioral distress. Because these strategies may be useful for children to achieve more positive attitude toward injection, therefore it can help them to cope in better way with their injections. This interactive computer game (Koodak-E-Tavana) has remarkable characteristics in structure and its content such as pay attention to the reasons of children’s fear and concerns toward injection, use of cognitive and behavioral theories for designing the games, special considerations about computer programming and developmental levels of children, as well as applying various entertaining games along with role playing, all aforementioned attributes have contributed in successful results of this inventory computer game. The game could provide suitable information to children in a simulated safe, joyful and attractive environment so that fear and distress of diabetic children about their daily injections came effectively down. There are so many researches that have pointed to positive impacts of video and computer games in field of health education (34, 35). One of the considerable strengths of computer games is their highly motivating effect on specific behaviors (36). In fact, if we could promote our clients’ participation in their self-care we would achieve higher knowledge and performance regarding to follow treatment regimen particularly when we are facing to repetitive daily treatments like insulin injection. One of the surprising findings in this study was performing insulin self-injection by children. It may be inferred that playing with interactive computer game can help children to control their fear and anxiety result from injection, in addition they achieved higher motivation for insulin self-injection. In the present study OSBD-R mean score were 2.5 and 2.4 in groups in baseline. Slifer et al. (2009) reported that most children (61%) with chronic diseases including diabetes mellitus, pointed to no distress to low distress (OSBD = 0-1) (13). Some studies have reported different level of distress because of the kind of procedure studied, variety of age groups and distinct assessment tools (10, 37-39). There are so many influencing factors on level of distress that children experience due to insulin therapy. Younger children usually suffer from higher level of distress-related behaviors in compare to older children and adolescents; the shorter history of diabetes in children, the higher level of distress might be manifested during insulin injection (10). Mohr et al. have shown direct relation between the numbers of injection and anxiety and fear of injection among chronically ill children (40). Consistency between this research and present emphasizes that during first months of diagnosis of diabetes and insulin therapy for younger children should be thoroughly monitored by medical staffs, because they may be experience high level distress. There were a few limitations in this study such as small sample size and no comparative game for control group, hence further studies are recommended to conduct with three groups, and or perform comparison between this computer games with other educational methods. Also, it is recommended that the future study to be conducted to assess the impact of this interactive game on self-injection anxiety in diabetic children. According to results of the study, computer games can be an enjoying, easy and affordable availability for reducing behavioral distress of children resulting from insulin injection, particularly among newly-diagnosed younger children. This article is part of a thesis for doing master degree in pediatric nursing. We would like to appreciate diabetic children and their mothers for participation in the study. Our special thanks to Isfahan Endocrine & Metabolism Research Center (IEMRC) and deputy of research in Isfahan Medical Sciences University for financial support of the study. We are also thankful to the reviewers of Iranian Pediatric Journal for their useful informative comments that improved the quality of the paper.